My city hop through northern Germany continued stopping in the beautiful harbour city of Hamburg for three nights. Here’s just a few places we sampled. Anywhere that has the item “Chuck Norris cornflakes” on the menu is a must try. 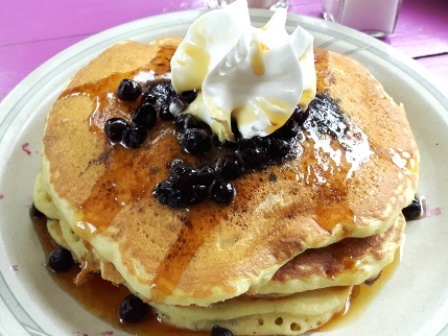 This American inspired cafe is well known for its pancakes and french toast which you can pile high with your choice of toppings, like begian chocolate chips, blueberries and whipped creram. Fried, poached, or scrambled… the choice is your with their range of egg dishes. All served with toast and a mini fruit salad. You also have an extensive list of extras that you can add on like cheddar, feta, mozzarella or parmesan cheese, mushrooms, sundried tomatoes, peppers, smoked tofu.. the list goes on. Being an American menu I had to order my absolutely favourite thing.. peanut butter. I could eat this by the bucket load and perhaps on more than one occasion have been known to eat it straight out of the jar with a spoon. Luckily they only gave me enough (only just enough by my standards though) to spread on my bagel, and with a side of fruit salad I was happy. However there was one sacrifice that we made here for the food, and that was the coffee. It was true American style filter coffee, with free refills, but definately left something to be desired and beware that the service did take a while, but they do have a sign up stating this. However go for the pancakes and you will not leave disappointed. This large cafe/ restaurant in Altona is open for breakfast, lunch and dinner. We met up with local friends there for breakfast. This bright and airy cafe (due to its huge windows) has the contemporary feel that is becoming ever the norm nowadays with lots of wood, exposed brick walls and designer lighting. However this interior is popular for a reason and with plenty of fresh flowers on the tables and cushions on the benches it had a welcoming feel to it. Their breakfast menu is a lot more traditional than those we visited in Berlin, with breakfast plates of cold cuts, cheese, marmalades and bread, available in varying sizes. One other breakfast item that Ive come to expect over here is eggs served in jars. 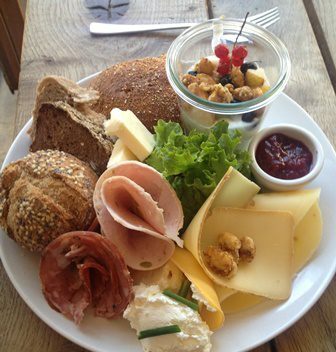 Here these are served with delicious slices of bread from Der Holzofenbäcker, one of their local partners. I went with their scrambled eggs on toast with chives and tomatoes. This was a welcome change from my usual and was just the right balance of creamy eggs and fresh tomatoes, but didn’t stop me from pinching a bit of Rogers bread from his breakfast plate as well. Mr Hoban’s Coffee Roastery supplies the coffee beans, and Mr Hoban knows how to make a good coffee. It was one of the best we had in Hamburg. This cafe is a bit out of the city, but it is definitely worth the train ride and Altona is a nice area to have a look around. Nestled within the beautiful UNESCO buildungs of the Speicherstadt (warehouse district) is a coffee museum, with its own roastery, cafe and shop, and so where better to get a good cup of coffee in the afternoon after a day of sightseeing. I have never seen a coffee menu so big before and I was so overwhelmed by the different choices of coffee beans that I deci ded to trust them and go for their own house blend. The cafe and shop is an entire floor of the building and we picked a table right next to their roastery machinery so we could listen in while they were giving a tour. 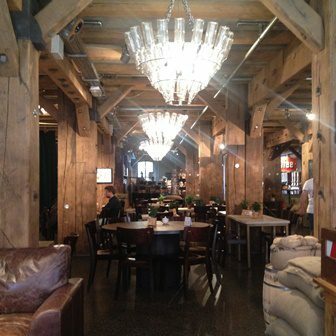 The interior showcases the old warehouses brick walls and wood beams, as well as utilising some quirky furniture choices, including old dentists chairs (endless fun for children and boyfriends alike) and hanging from the ceiling are cool chandelier lights made out of bottles. Nothing goes with coffee better than cake, and luckily they had some great homemade cakes to choose from to complete our afternoon indulgence. Just a stones from the busy harbour on a residential back street you will find Cafe Johanna. We stopped in on our last afternoon to recharge with some more coffee and cake, and was such a welcome break from the hoards of tourists down by the harbour. The small cafe itself it pretty basic, but the food and coffee is anything but. 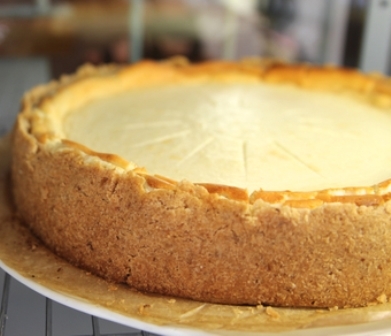 We enjoyed a lovely relaxing half an hour with a great cup of coffee and an even better piece of cheesecake. We were there quite late and so the cake selection was pretty limited, but get there earlier and you will be treated to an amazing range of mouth watering homemade treats like scones, lemon tart, chocolate bomb cake with mascapone and raspberry compote (even this is homemade), orange cake, carrot cake… need I go on? A lot of their other produce is also homemade, like their brioche, herbed cream cheese and tomato pesto. If you are passing by around lunchtime, their menu looks fantastic, with house made tarts, baked goats cheese on toast with apple, rosemary and honey, or focaccia bread with tomato and orange pesto, gruyère, and chorizo. I’m getting hungry just writing this. On our first night in Hamburg we were feeling like some comfort food, so what could be better than burgers and beer. So off we went in search of “Das Altes Mädchen”. Located just behind Sternschanze station this brewery and restaurant is well known for its huge selection of beers, and when I say well known, I mean well known. It was a Monday night and it was packed. It wasn’t that warm but even their beer garden was full. Luckily we grabbed a table (inside) as some people were leaving. This place is pretty big, yet has a vibrant and welcoming atmosphere , with really good wait staff and is obviously a local choice for after work drinks and a bite to eat. They have lots of seating options from normal restaurant tables, bar tables, and seating directly at the central bar, where all the action happens. Their drinks menu is huge, with beer for every taste; wheat beer, pale ale, bitters, lagers, stout, fruit beers and non-alcoholic beer, from all around the world. They also cater for the non beer drinkers with wine, cocktails, long drinks and other non-alcoholic drinks. I tried their local brewed cider which was really nice. However its not just their beer that draws the crowds, their food is also something to rave about. I love mushrooms and so I couldn’t go passed their veggie burger with portobello mushrooms and hummus, whereas for Roger a burger needs meat and so he went with the beef burger with avocado and chilli. Their pull pork burger was also very tempting. This is not just your standard pub food, you can have vegan pasta, quinoa salad, braised ox cheeks or large sharing plates. With each item they recommend a beer that compliments the dish, although Im not exactly sure what goes well with ox cheeks. The burgers were awesome and I was full, but curiousity got the better of me and we had to try the chocolate mint cake with beer ice cream. Both the cake and ice cream were so good and even though I don’t really drink beer, pour it in ice cream and I’m sold. When in Hamburg, sampling fish is a must. We had the fisch brötchen sorted early on and so whilst exploring the harbour we thought we’d step it up a notch and try a bit more of an up market fish experience. La Vela is one of the restaurants right on the harbour. If they didn’t have barriers up, a couple of steps from where we were sitting and you would be taking a swim. Therefore we did pay a little bit more for our lunch here than other days, but I think it was well worth it. We went with their lunch menu so as not to break the bank too much. Roger selected the mixed fish plate to capitalise on the opportunity to eat as much good fish as he could and I chose the hake served on a bed of tomato based risotto. When the dishes were set down in front of us they were stunning and I couldn’t wait to tuck in. 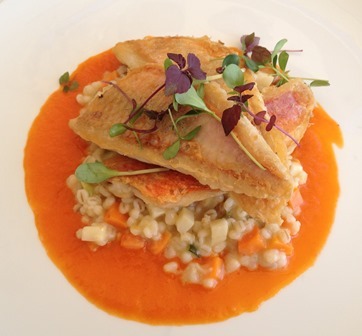 The fish was cooked beautifully and the risotto was delicious. This is predominatly an italian restaurant and so on their main menu they have a good selection of pasta dishes as well as meat dishes. We were really undecided as to where to go for dinner one night, and so we decided to head to an area known for its restaurants and bars and just pick one as we went. So off we headed to St. Georg and wandered down the vibrant Lange Reihe. Here you will find a whole array of cuisines to choose from and after walking nearly the whole length we were still undecided, and so on the corner we spotted a bistro that was heaving and went to check it out. They had no tables available but could squeeze us in at the bar if we wanted, which for me is always a done deal. I love sitting at the bar as you get a really good feel for the restaurant and can watch everything that goes on. The beauty of also being at the bar is fast drinks service. The barman was brilliant. He was not only doing all of the drinks and taking the orders of the people sat around the bar, but was also responsibile for more tables, yet he was efficient, helpful and really friendly. So as my glass of beautiful German Merlot („the Answer“) was poured for me, I was a happy camper. I absolutely loved their menu, but was unfortunately not that hungry after pigging out on cake earlier on, but that did not matter as they had a New Zealand lamb salad. Lamb is my absolute favourite meat and something quite rare here in Vorarlberg and so any chance I get, I eat it. Roger also went with a prawn salad, but for bigger appetites they had homemade tagliatelle, Hereford filet steak, and pulled pork brioche burger. They also had lots of dishes for sharing (think Flammkuchen, meat and cheese sharing platters etc ), which seemed a popular choice amongst the other diners. The salad was just what I needed; just the right size and just enough lamb, cooked well (although more is always better). 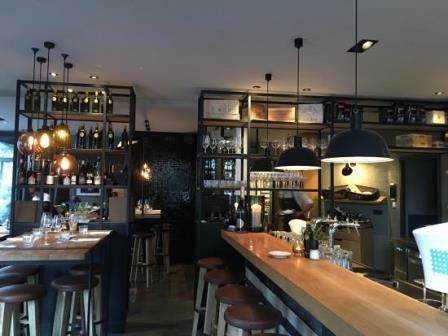 Neumanns had the looks of an upmarket winebar, but with the relaxed and inviting atmosphere of a casual Bistro, and is definitely worth a visit, even if its just to sample the wine. 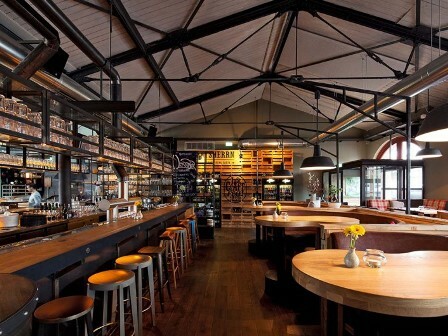 Have you been to Hamburg lately? What were your favourite places?